Check out this CD with Kenny Shuda! Kenny Shuda is the talented leader of the Kenny Shuda Orchestra. 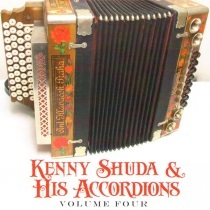 Here is Kenny Shuda and His Accordions on this CD entitled “Volume 4”. A special treat comes to you on this CD as Kenny Shuda plays concertina on 3 different tracks including a version of Syl Liebl’s Bobby’s Polka. Check out Kenny Shuda via this CD today!